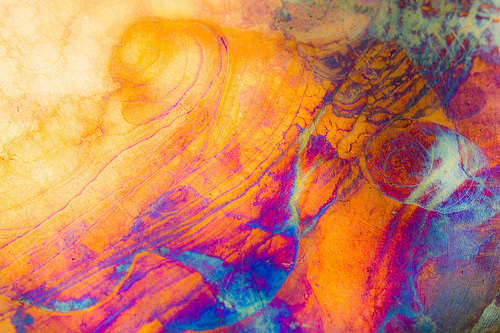 These two photographs were taken using a 10x magnifier on an 18-55mm lens. This combination allows me to get very close to my subject which in this case was a copper-bottomed pan. 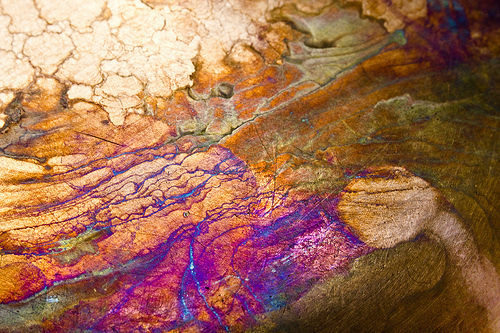 In "Cosmos I" I left the colors true to the original oxidation patterns. In "Cosmos II" I played with the colors a bit in Adobe Lightroom. I had samples printed on several types of paper. I liked the way they looked on the Photo Rag paper best. The prints are 16X24 inches, plus mats and frames. These two pieces also showed at the VACI Member show in August 2013 in Chautauqua, New York and again at the Lakewood Library Heritage Room in April 2014. Both sold while on display in Lakewood.